A brand new style of map booklet by Westprint. 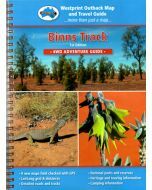 The 2200 Km Binns Track is covered on 9 new maps in a spiral bound book with information relating to each map displayed on the facing page for ease of reference. Bill Binns contacted Westprint Maps to see if there was an interest in developing a map series highlighting the particular stock routes that could be used to link various parks and features of the Northern Territory. This resulted in a map referred to as the Original Binns Track map. 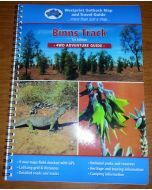 John and Bev Deckert travelled many of the routes marked by Bill as they did the ground research for a proposed series of maps to be produced for the NT Government by Westprint. Unfortunately a change of government shifted the focus on this project and only one map in the series was published at that stage. However, behind-the-scenes work continued with the idea of linking tracks resulting in the promotion of several designated 4WD tracks featuring the Explorer Territory logo. This culminated in the eventual launch of the Binns Track in May 2008. Thousands of experienced 4WDrivers have enjoyed the amazing diversity of Northern Territory landscapes ranging from deserts to tropics with matching wildlife and vegetation. 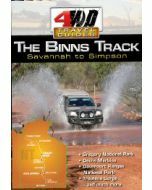 The Binns Track is made up of varying road surfaces from bitumen highways to rugged, tyre-punishing rocky tracks and is not to be taken lightly. However, it is a track that has a regular flow of traffic and a small convoy of two or three vehicles will increase the safety margin immensely. 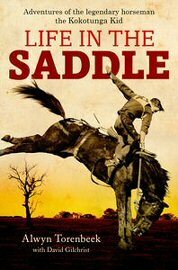 Bill Binns has now retired but still takes a personal interest in one of the longest tracks in Australia, the 2,200 kilometre Binns Track.